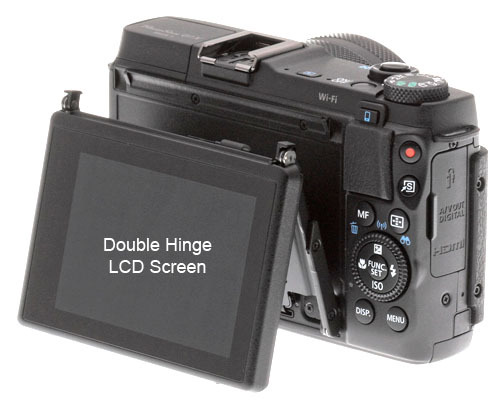 The Canon Powershot G1X Mark II LCD screen was designed with a double hinge. This gives you the ability to shoot from a high or low perspective without having to stand on a ladder or lie down on the ground. At first I was disappointed that it didn't swivel sideways like the G1X original's LCD screen pictured below. 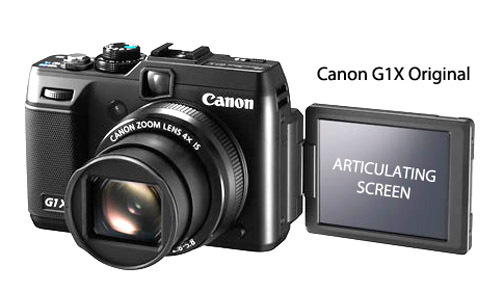 After a little thought, I realized that I never really used that feature on my Canon G11 which has the same type of articulating LCD screen as the G1X. Both of these screens are better than using the optical viewfinder that Canon jammed into the original G1X. 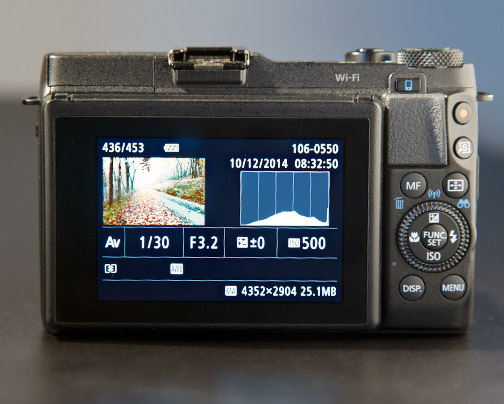 That viewfinder only shows 80% of your image. 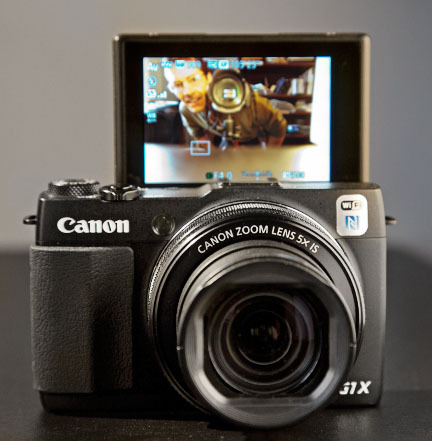 That optical viewfinder on the G1X is undersized and gives you no data like shutter speed, aperture, or ISO settings. The LCD screen flips up 180 degrees for taking those ubiquitous selfies that have permeated our culture. This is actually a better set-up than shooting a self portrait with the LCD off to the side. 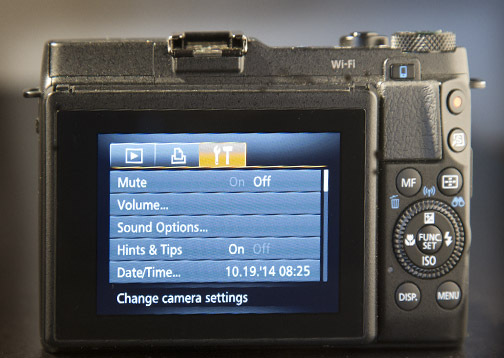 Having the screen close to and directly above the camera makes it easier to compose and look into the lens. Selfie portraits have become such an accepted thing to do that the desire to capture self-portraits has been a driving force in camera lcd design. This is probably the way I use the screen more than any other. I am big on using histograms to monitor and adjust the exposure and I always like to know the four settings shown above, shutter speed, f-stop, exposure compensation, and ISO. Occasionally I'll also use the zooming in playback feature to check for focus, but I still find that LCD screens are not as good as your full-sized computer screen to check out the very fine focus of an image. In the last several years, consumers have clearly let the camera and cell phone manufacturers know that they like bigger LCD screens. The 3.0 inch is pretty much the standard size for compact and DSLR cameras and the G1X Mark II doesn't fall short in that aspect.